For the last few days, I have been listening to the audiobook of The Jane Austen Diet by Brian Kozlowski. Time is short and my list of things to read for this A to Z Challenge is long. I think that the last time I listened to an audiobook, it was actually called books on tape. My friend and I were listening to an Anne Rice book while on a road trip to New Orleans. Good times. It’s been nice to be able to some gardening and listen to the reasons why people in Jane Austen’s novels weren’t usually too fat or too skinny. They didn’t worry about carbs or gluten. We forget what it was like to be active and not always snacking or drinking excessive coffee or alcohol. According to Kozlowski, our sedentary lifestyle and always having snacks has led to many of us being overweight. Also, sugar is easier to attain. In Jane Austen’s time, sugar was usually kept under lock and key rather than sitting in a container on the kitchen counter. Our eating schedule is also different than those who lived and ate during the Regency period. They tried to eat a decent breakfast a bit later in the morning. Lunch was usually for the upper class. Dinner was sometimes held as early as 3 p.m. Early morning coffee may not be the best thing since it could interfere with cortisol production. Cortisol is a hormone that regulates stuff like our metabolism. So if we can wait until 9:30 then we won’t be messing around with cortisol. The author points out that none of the female Jane Austen characters are alcoholics. In fact, the women think that drinking is extremely distasteful. I guess being teetotalers kept them skinny. You can drink and not necessarily get fat. However, alcohol and drink mixes contain sugar and calories. It’s something you forget when you are on your second or third margarita. Kozlowski notices many interesting things about the eating and exercise habits of the characters. If it weren’t so interesting, I think I wouldn’t want to listen to the audiobook at all. I would totally recommend reading this book or listening to the audiobook. 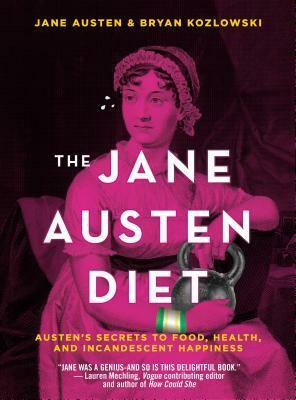 If you are a Jane Austen, then you will probably enjoy all of the insights into health and exercise. This book sounds interesting. I looked it up at our local library and they have it! Thanks for the recommendation. It really is interesting. I’m so glad that you found it! 🙂 You’re welcome!